An exaggerated crime caper with Jackie Chan fighting international terrorists on board a luxury liner in shades of Steven Seagal’s Under Siege, but that’s where the similarities end. 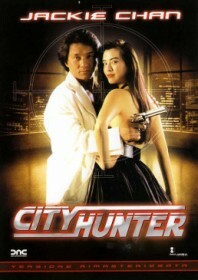 City Hunter is a truly wacky and eccentric gem, relentless in its childish humour and top notch action. Based on a Japanese manga, Chan is the womanising Ryo Saeba, or ‘City Hunter’ to his fans. He’s a top cop sent on a mission to retrieve a newspaper tycoon’s rebellious daughter (Goto). She boards a luxury cruise ship only for it to be hijacked by dastardly gweilos, led by Norton and his sidekick Daniels. The pace never lets up and the set pieces are truly memorable. In one instance, Jackie is given onscreen instruction from Bruce Lee on how to tackle two extravagantly tall combatants, replicating the classic fight sequence between Lee and Kareem Abdul-Jabbar in Game of Death which just happens to be playing in the ship’s theatre. The film climaxes with a particularly surreal live action parody of the Streetfighter 2 video game, featuring Chan and Gary Daniels donning the appropriate costumes in a wildly imaginative segment that manages to be infinitely more accurate and entertaining than the big-budget Hollywood version, released the following year.